Good beer is a taste-intensive and surprisingly versatile accompaniment to good food--often better suited than wine. 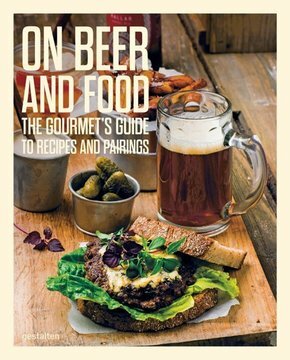 This book presents rescipes and fundamentals that explore the pairing of food and beer. Until recently, beer had been grossly underestimated as an accompaniment to sophisticated cuisine. But the booming craft beer movement is now sparking a fundamental shift. Diversity in aroma and nuance in flavor make these enw beers a wonderful complement to food--at times even better and more original than wine. The Gourmet's Beer Cookbook shows what an extensive, vibrant, and interesting role beer can play in the dining experience. Aside from an introduction into the culture and flavors of craft beer, this book presents recipes from innovative chefs to create deliciously adventurous food and beer pairings. These include tarte flambee with green asparagus to be served with Flemish red beer and saddle of veal with vanilla carrots and potato medallions to be served with pilsner. Desserts too can be coupled with the right beer for a unique taste experience, as with plum pancakes garnished with wheat beer zabaglione and served with wheat beer itself. Beer is not only for drinking. Used as an ingredient, it can provide dishes with the perfect seasoning. But when a strong companion for a meal is needed, a beer's spices and hoppy character make it an excellent choice. It can work as a harmonious complement to a dish or provide it with a surprising contrast, remaining distinct while not overshadowing any flavors. As an extension to our recent release Barley & Hops, The Gourmet's Beer Cookbook is a book for all who enjoy good food and drink, like to cook, and are enthusiastic about new taste experiences.